EVO 2018 has just concluded, and as each year, the amount of growth, hype, and competition continues to rise. 8 games were played over this weekend, and 8 winners were able to taste victory and claim the title of best player in the world. Although EVO was successful once again, and had many exciting tournaments, there was an outlier in all the success. The first tournament to be finished was Injustice 2, which concluded on Saturday afternoon. While the entrance size was relatively small compared to the other events, there was still stiff competition nonetheless. In the top 8 of the tournament were SonicFox, Big D, Rewind, Semiij, Biohazard, Tweedy, SylverRye, and Hayatei. Fan favorite, SonicFox, started off in the winners bracket, taking down Big D, but ended up falling to Rewind. While it was a hard-fought battle, SonicFox fell to Tweedy, and Tweedy he then went on to face the admirable Rewind in Grand Finals. While Tweedy went for it, Rewind had other plans, and ended up taking the entire tournament in convincing fashion without a bracket reset. The next tournament to conclude on Saturday was BlazBlue: Cross Tag Battle. While BlazBlue is no stranger to EVO, it is the first time that Cross Tag Battle, which adds characters from RWBY and Persona 4 Arena among other balances, has been played at EVO. With over 1,000 entrants, the best 8 players from the world, kojiKOG, DORA_BANG, Fenritti, Fame96, heiho, GOUDA, Kazunoko, and Dettywhiterock, battled their way to the top. Fame96 made his way through the winners bracket, knocking Fenritti and DORA_BANG into the losers bracket, securing his spit in Grand Finals. Meanwhile, in the losers bracket, heiho fought tooth and nail to make his way all the way through the lower bracket to put himself in Grand Finals against Fame96. In an exhilirating turn of events, heiho kicked things into overdrive to reset the bracket, and forcing a second set to be played. After come all the way from losers eights, heiho went the distance, and claimed victory over Fame96 to become the BlazBlue world champion. 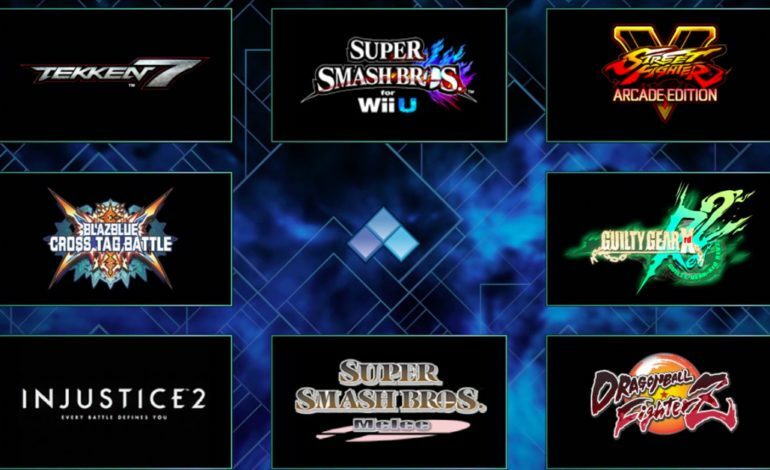 The last tournament to finish on Saturday was Super Smash Bros. for Wii U, and was most likely the last tournament for the game at EVO. While there was fierce competition and tons of exciting plays, the hatred of one of the best characters, Bayonetta, was in full effect, especially during the Grand Finals. In the top 8 were CaptainZack, Mr E, Lima, Mistake, Raito, MVD, Nietono, and Choco. While things were still competitive during the top 8, things went horribly awry during what was supposed to be the apex of the tournament. In the end, CaptainZack and Lima, who happen to be good friends, ended up sandbagging, or playing well below a competitive level. There was an absurd amount of goofy plays and unnecessary stalling that made the prestigious Grand Finals look more like a casual set of friendly games at a friends house. The aftermath of this tournament left a sour taste in many competitors’ mouths. While this is upsetting to many, next year, Super Smash Bros. for Wii U will almost certainly be replaced by the upcoming Super Smash Bros. Ultimate, which will come packaged with even more fighters, gameplay balances, and more variety to play aside from Bayonetta. The following morning, Guilty Gear‘s tournament was concluded. In the top 8 were Omito, Rion, Zadi, Machabo, Fumo, NAGE, Fukuda Norihiro, and Lost Soul. While there were no moments like Woshige’s massive blunder of 2015, one competitor, Omito, was determined to take the whole thing. While he made quick work of Rion in his first match of top 8, Machabo gave Omito a run for his money, and almost knocked him down to the loser’s bracket. With pure willpower and skill, Omito eked his way into grand finals. In the losers bracket, however, Lost Soul was making an amazing loser’s run, fighting his way from losers eights to the losers finals. While things were looking to go Lost Soul’s way from the amazing momentum he had, fate had other plans, as Machabo defeated Lost Souls to meet Omito once more in Grand Finals. However, Omito made quick work of Machabo this time around, closing out the tournament with a 3-0, and also cemented his status as the best Guilty Gear player by not dropping a single set during the entire tournament. Next up was the Super Smash Bros. Melee tournament, which had many twist and turns as opposed to its other EVO years. In the top 8 were Hungrybox, Leffen, Plup, Mang0, Armada, S2J, Wizzrobe, and Swedish Delight. What is significant about this top 8 is that Armada, one of the 5 Gods of Melee, came into top 8 from losers, which is something that never happens, and Mew2King, one of the other 5 Gods, was not in top 8 at all. Armada faced elimination many times prior to top 8, but S2J took him to his absolute limits, but failed to close out the set, losing 1-2. On the winners side of the tournament, Leffen and Plup both fought their way to winners finals, taking out the other two gods left in the tournament, Hungrybox and and Mang0, to losers. In winner’s finals, Leffen beat Plup 2-0 to place himself in the Grand Finals, the first time since EVO 2007 that hasn’t had one of the 5 gods of Melee. Armada had an amazing losers run, taking out Mang0 and Hungrybox to earn his spot in the Grand Finals to face Leffen. This Grand Finals also marked the first time ever that Grand Finals for this EVO tournament had exclusively Swedish players. In an immaculate display of willpower, Leffen made quick work of Armada, and closed out the tournament with an impressive 3 – 0 performance, making him the first ever winner of EVO outside of 2007 that isn’t considered a God. Following the Melee tournament, Tekken 7 was played. The best of the best made it to top 8, and those players were JDCR, Lil Majin, LowHigh, quadans, Rangchu, Noroma, Chirichiri, and Book. One of the biggest highlights was the impressive play of Lil Majin, who used King, a character that is hardly ever used at high levels of competitive play. Although he made it to winners finals, his fate lied elsewhere, for he was brought down by LowHigh, and in losers finals, he lost 3 – 0 to quadans. Despite the 3rd place finish, his performance was phenomenal given his character choice. In Grand Finals, however, quadans had to take two sets off of LowHigh to take home victory. The first set was highly contested, with each round being at least somewhat close, and quadans reset the bracket against LowHigh 3 – 1. However, LowHigh brought it back to prevent quadans from taking the entire tournament. The second to last tournament played, Dragon Ball FighterZ, was the most entered tournament at EVO 2018, surpassing the entrants to Street Fighter V. The tournament was staked, with familiar faces making appearances in previous tournament. The top 8 consisted of SonicFox, Fenritti, GO1, Kazunoko, Moke, Supernoon, KnowKami, and kubo. Fan favorite to take the tournament, SonicFox, started on winners side, never dropping a game in each of his sets, defeating Fenritti and GO1 to make his way to Grand Finals. In the losers bracket, KnowKami made an impressive comeback against kubo, and moved onwards in the bracket. Unfortunately, he was bested by Fenritti in the next round. Fenritti fought his way to the losers finals to face off against GO1, but his best wasn’t enough, and GO1 took the set to face off against SonicFox once again in the Grand Finals. Although SonicFox had made easy work of GO1 in the winners finals, GO1 made some adjustments to reset the bracket with a clean 3 – 0 sweep. After the bracket had reset, SonicFox collected himself in order to start making the adjustments to avoid being eliminated. After some very heated matches, SonicFox convincingly took things back into his own hands, and took out GO1 is spectacular fashion, and claimed first place at the first Dragon Ball FighterZ EVO tournament, as well as first place in the biggest tournament at EVO. Finally, to top things off, the main event of the evening was played: Street Fighter V. This year’s Street Fighter finals had a much more diverse top 8, featuring players from Japan, UK, USA, France, Japan, and even the Dominican Republic. The top 8 for Street Fighter V consisted of Problem-X, gachikun, Fuudo, Tokido, Luffy, THE COOL KID93, Caba, and Fujimura. The fighting pride of the UK, Problem-X, had a tall order of being the only non-Japanese player in the winners bracket. He fought hard to beat gachikun in a solid 3 – 1 performance, and things got even closer when he went up against Fuudo. It was a close match that was fought tooth and nail, but Problem-X clutched things out in a 3-2 victory to make it into Grand Finals. The potential for a Cinderalla story for the USA and the Dominican Republic were unfortunately dashed early on, with THE COOL KID93 and Caba being eliminated early during the top eight, but they put up a good fight, making Luffy and Fujimura work for their victories. In the losers bracket, Tokido made his way convincingly through the opposition, knocking out Luffy, gachikun, and Fuudo to cement his place in the Grand Finals against Problem-X. In a true nail bitter, Tokido took Problem-X to his absolute limits, and managed to barely inch his way to reset the bracket. Under immense pressure, Problem-X brought things back, and defeated Tokido in a 3 – 0 show of skill, and took home the first Street Fighter win the the United Kingdom. You can check out the vods of each respective tournament over at the official EVO Twitch channel.